Hanne D. Neby has been working at CSUSA since June 2017. She is a Recruitment Consultant and works primarily with our Norwegian women’s soccer players, skiers and track & field athletes. Hanne D. Neby studied and played college soccer her first two seasons at University of Texas at Brownsville, a school which at that time played in the Red River Athletic Conference (NAIA). She had two good seasons where she both years was named First-team All-Conference, before she transferred schools and became a Purple Knight at University of Bridgeport in Connecticut (NCAA D2). In Bridgeport she was part of a record-breaking team when UB Women’s Soccer made it all the way to NCAA D2 Final Four for the first time in the program history. The team was also back-to-back Conference champions and Regional Champions in 2016. In her two seasons as a Purple Knight, Hanne started all the games and received several awards, such as First-Team All-Conference and First-Team All-East Region. In 2017, she graduated from University of Bridgeport with a General Health Science Bachelor’s degree, and a 3.9 GPA. With her excellent academic achievements, she was also a regular on the schools President’s List. Hanne grew up in Hamar, Norway (one hour north of Oslo), and in the time prior to college she played for FL Fart. At her time in the club she experienced playing both in the Norwegian 1st division (2nd tier) as well as in Toppserien (highest league). 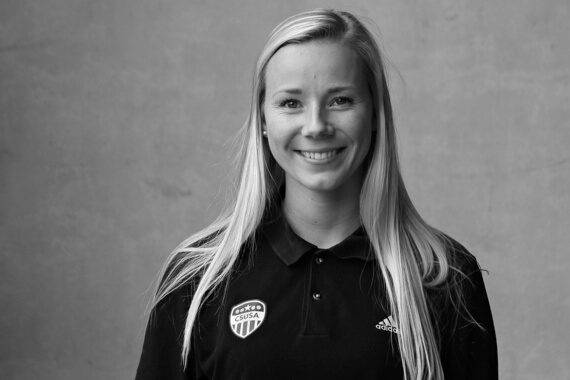 She was a student at the sports high-school Storhamar VGS, and decided to follow her dreams about college soccer when graduating. Fall 2013 she moved to Texas where she started the first of her four years in the States. Beating The Regional Final in 2015 against Adelphi University. From being down 1-0, we tied the game before our captain boomed a free-kick from 20 meters into the top corner, and we were up 1-2 with less than 10 minutes left of the game. We kept the lead until the game was over, and could proudly lift the trophy as East Region champions for the first time in UB Women’s Soccer history.